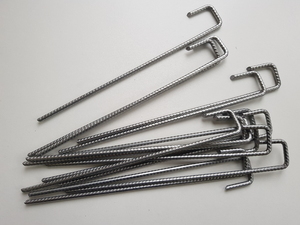 Our range of ground anchor pins and pegs can be used for many applications to secure wire fencing, landscape fabrics and plastic mesh grass reinforcement mesh to the ground. 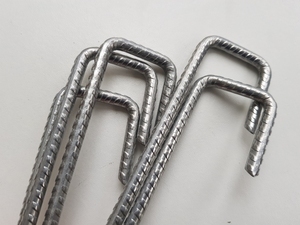 Our galvanised J-Pins are suitable for securing the base of wire mesh fencing, guy ropes and as tent pegs. The longer and thicker 8mm J-pegs are ideal as ground anchors. 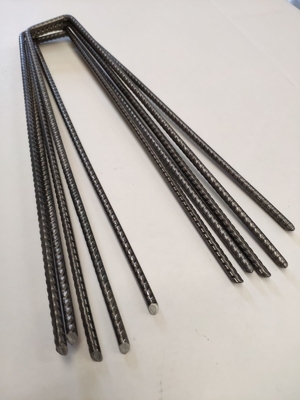 Steel U-Pins are used to fix our range of grass reinforcement mesh, plastic turf meshes, geotextiles, weed control fabrics and artificial turf to the ground. We stock J-Pins from 200mm long up to 500mm long - ideal for slope and erosion control applications. Our galvanised re-bar pins come in two wire thicknesses of 6mm and 8mm. 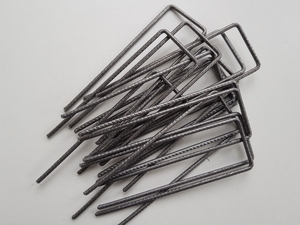 Our U-shaped steel pins are used for securing grass and turf reinforcement mesh to the ground.